As part of my research into the ways that pilgrims and their guides authenticated holy sites during classical and late antiquity, I’ve been looking at springs, wells, cisterns, and other water sources that appear in pilgrimage narratives. The reason for the focus on water sources is that pilgrims frequently mention them as a way to demonstrate the authenticity of a holy site. For example, the Bordeaux Pilgrim and the Piacenza describe the Well of Jacob as still flowing in their own day, as a means of authenticating the site they’re visiting, connecting the present to the past, and demonstrating continuing divine presence – as water from such sources is often associated with miracles and blessings. The Bordeaux Pilgrim (BP) is particularly fixated on water and water sources. Susan Weingarten noted that the BP describes over 15 water sources in his relatively spare account of travels in Roman Palestine. As many readers will know, the BP’s text is mostly a bare-bones itinerary that lists distances and stopping points on a journey from Bordeaux to the Holy Land in 333 CE. In this respect, the BP text is similar to the 2ndcentury Antonine Itinerary. However, when the traveler enters Palestine at Caesarea, the text changes and the author offers commentary on mostly biblical and Christian sites. The BP begins his commentary on the holy sites by describing their association with water, starting with the Balneus(Bath/Baptistry) of Cornelius the Centurion at Caesarea and continuing to the sacred spring at Syna (Shuni), where women bath and become pregnant. The pilgrim explores other water sources during his travels, some of which you can see me talk about here, and others about which I’ll speak at the SBL in Denver in November. The water that concerns this entry, however, comes from a curious sentence that appears in the pilgrim’s commentary on the Church of the Holy Sepulcher in Jerusalem. I was drawn to the passage after reading it in the translation by John Wilkinson – probably the most widely quoted English translation. According to Wilkinson’s translation, the pilgrim notes that Constantine built a basilica there and that it has “cisterns of remarkable beauty.” I was really struck by the passage when I noticed Wilkinson’s translation, because it seemed to fit so well the BP’s general preoccupation with water. I also just loved the idea that the one architectural detail of the church that the BP found beautiful were the cisterns. Such a sentiment does not seem impossible for the pilgrim. 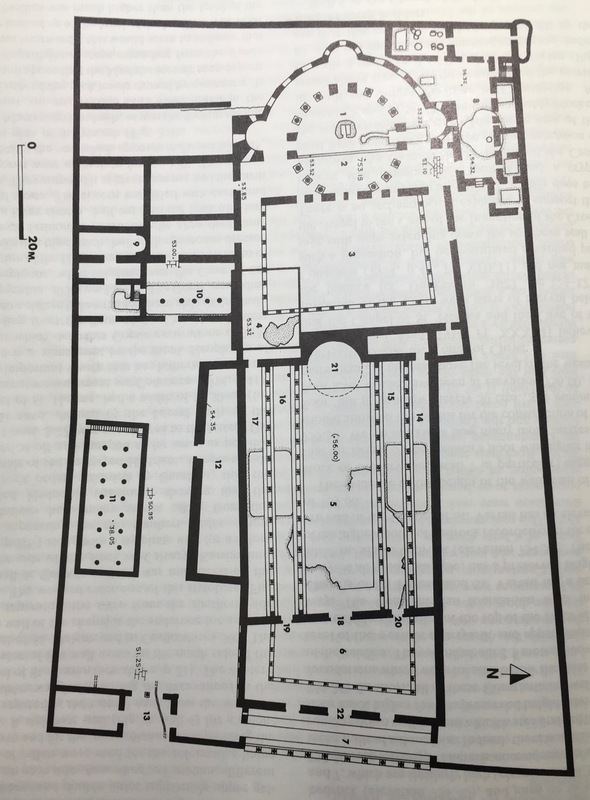 For example, prior to arriving at the Holy Sepulcher, he comments on the size and scale of “Solomon’s” cisterns near the temple mount (590). 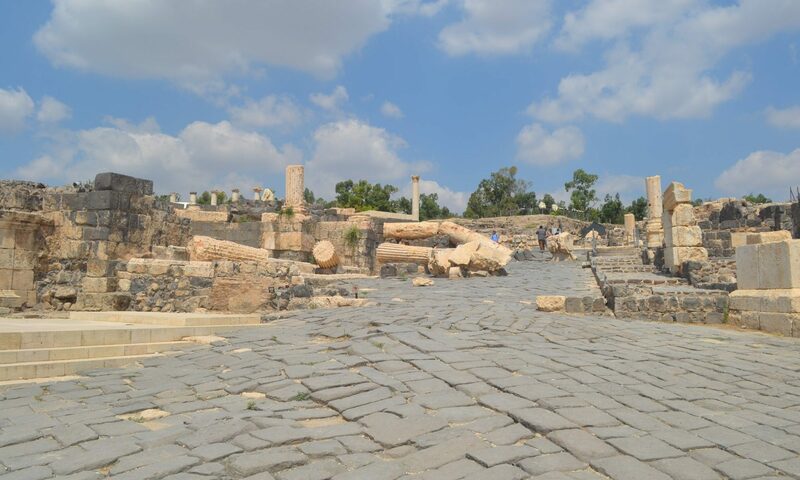 The temple was, of course, no longer standing and the remaining water storage, although not from the Solomonic era, is proof for the pilgrim of Solomon’s reputation as a builder. Reconstructed plan of Constantinian basilica at Holy Sepulcher. After Gibson and Taylor, 1994, p. 75.
ibidem modo iussu Constantini imperatoris basilica facta est, id est dominicum, mirae pulchritudinis habens ad latus excepturia, unde aqua levatur, et balneum a tergo, ubi infantes lavantur (Itin. Burd. 594.2-4). Aubrey Stewart, in his 1896 English translation for the Pilgrims Text Society, translates the passage similarly, having apparently decided that the beauty must belong to the basilica as a whole and not just the cisterns (p. 24). There are a couple of other items of linguistic interest in the passage. On basilica: As other scholars have noted, the pilgrim assumes that his reader may not understand what “basilica” means in reference to ecclesiastical architecture. The term “basilica” is borrowed from Greek and can also describe a form of Roman civic architecture. However, the use of the term for a church building appears to be new enough that the pilgrim has to explain it. On balneus: Context indicates that the use of the term balneushere means a baptistry, although it can mean “bath” in other contexts. It follows that the term levantur means baptize here, although it can mean “wash” in other contexts. The use of balneushere has important implications for other parts of the BP text. For example, when the pilgrim describes the balneus of Cornelius the Centurion at Caesarea (585), he may refer to a baptistry or a bath, or a bath that is now a baptistry. Whether or not the balneus the pilgrim saw belonged to Cornelius or even the first century remains an open question. However, I think we can say for certain that while the cisterns at Constantine’s basilica were apparently worthy of comment, the Bordeaux Pilgrim describes the basilica as a whole as “of remarkable beauty” and not just the cisterns. S. Weingarten, “Was the Pilgrim from Bordeaux a Woman? A Response to Laurie Douglass,” JECS 7 (1999) 292 (of 291-7). Previous PostPrevious Did Egeria eat fish at Edessa?